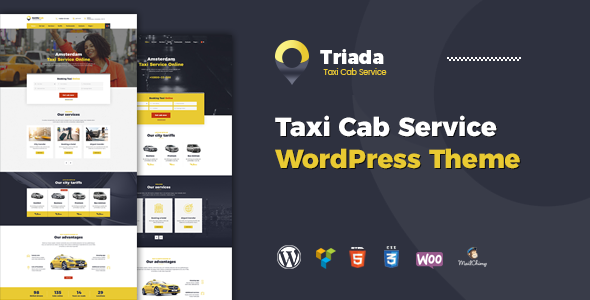 Triada â€“ is a Taxi Cab Service WordPress Theme created specially for Taxi Services, Taxi Companies, Taxi Cab and Transport Companies and other areas. Triada Taxi Theme includes all the necessary pages of the online store WooCommerce ready. So that you can sell your products. This theme contains everything you need: 2 awesome homepage layouts, a lot of unique shortcodes, galleries, blog, testimonials, products catalog, product page, about company page, services, shoping cart, order. Also the theme includes additional pages with different content elements such as typography, headers, icons, lists, tabs, sliders, 404 page, and many others. This theme is compatible with a bundle of premium plugin: Visual Composer. This Plugin is easy to use drag and drop page builder that will help you to create any layout you can imagine fast and easy. No coding skills required!